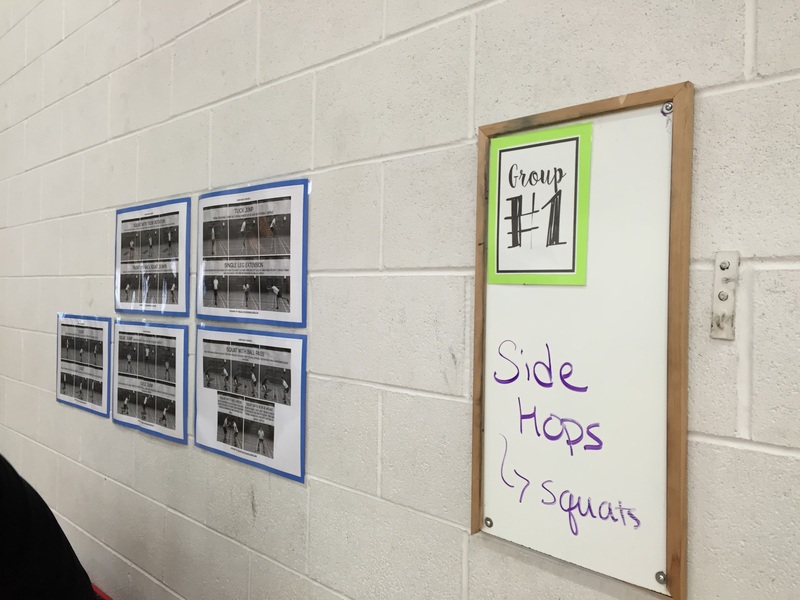 In my class, workout/fitness activity is the standard for the beginning of every class. The workouts are never long but my hope is for students to gain confidence in building their own fitness routines, have an opportunity to work with a variety of students, and learn that you don’t have to spend tons of $$$ or time in order to get have a impactful workout. Additionally, my goal is to have the first 15-20 minutes of class completely student-directed. Here’s a picture of what my students see when they first come into the classroom. They are expected to read it and know what’s going on while they are walking laps at the start of class. Once lap time (one song) is over, they get into their teacher-selected fitness groups* (thank you, Team Shake) and get to work. At the start of the week, getting to work means writing individual S.M.A.R.T. goals and playing a fitness game. 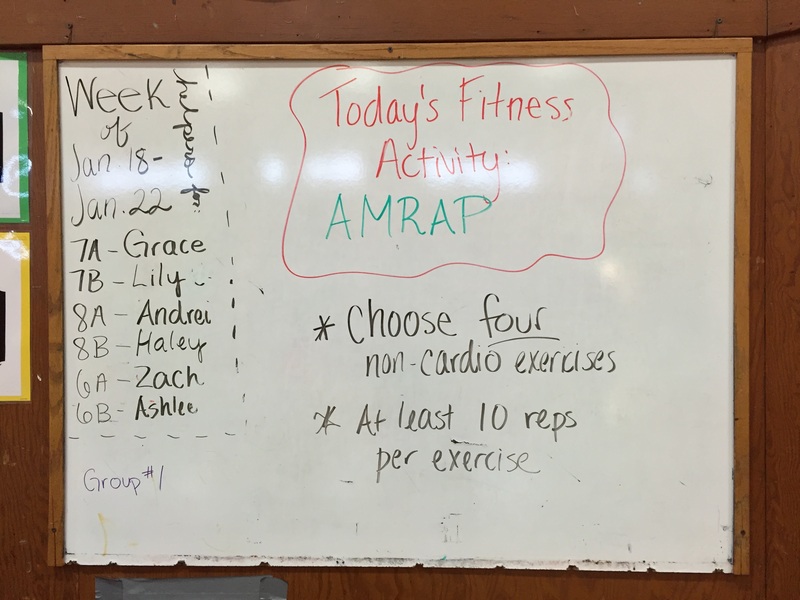 As the week progresses, getting to work means doing a group workout (like an A.M.R.A.P. 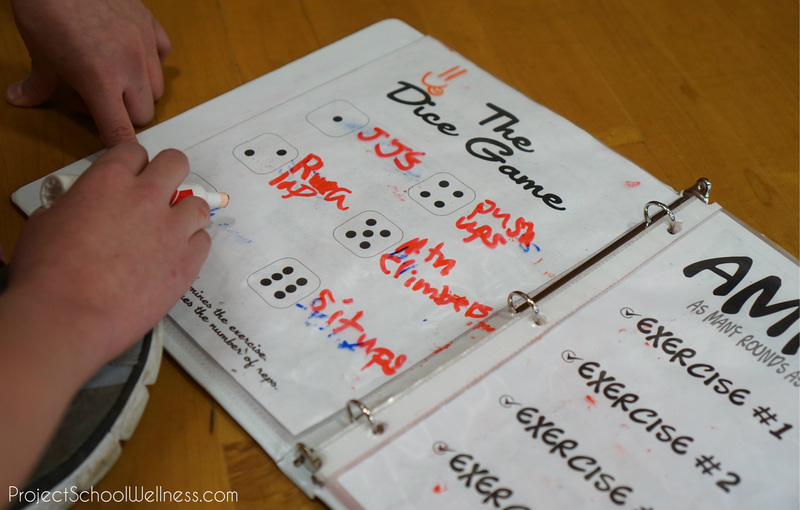 or the Dice Game ← click to access these printables). *Teams are made up of 3-4 students and teams workout together for a month. I choose the teams as a way to encouraging kids to step out of their comfort zone and build social well-being. Additionally, each week a different student serves as leader. This is a way to challenge students to take on different social roles. As previously mentioned, after one song groups meet at their designated area by a magnetic white board mounted to the gym wall. As the group is gathering, the leader grabs the team fitness binder & box and then they get to work – work, work, work, work, work (#sorrynotsorry). 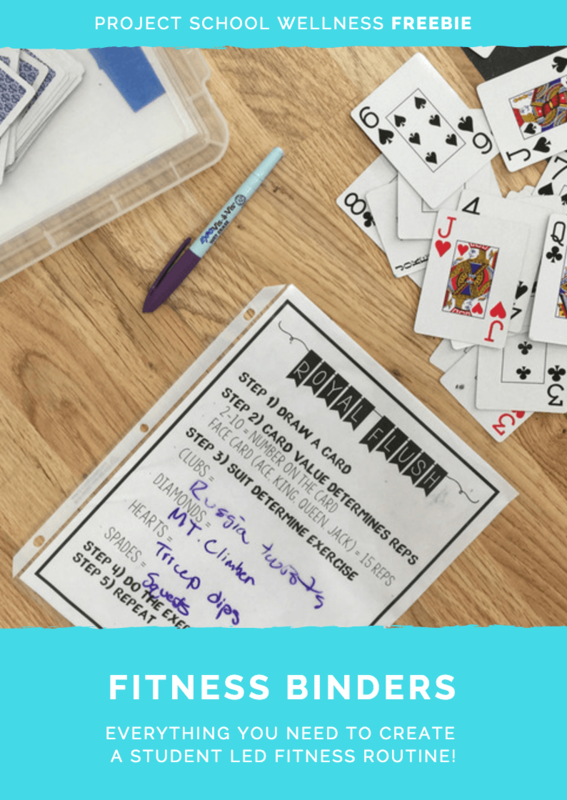 Inside each binder there are five or so activity pages (Download this freebie and a photo catalog of 50+ exercises. Most days I choose the activity but once in a while it’s a “you pick” kinda day. I’ll admit, I didn’t add any new games last year…So that’s definitely something I’ll be doing differently this year (Please send me any suggestions). Along with the binders, each group has a fitness box. 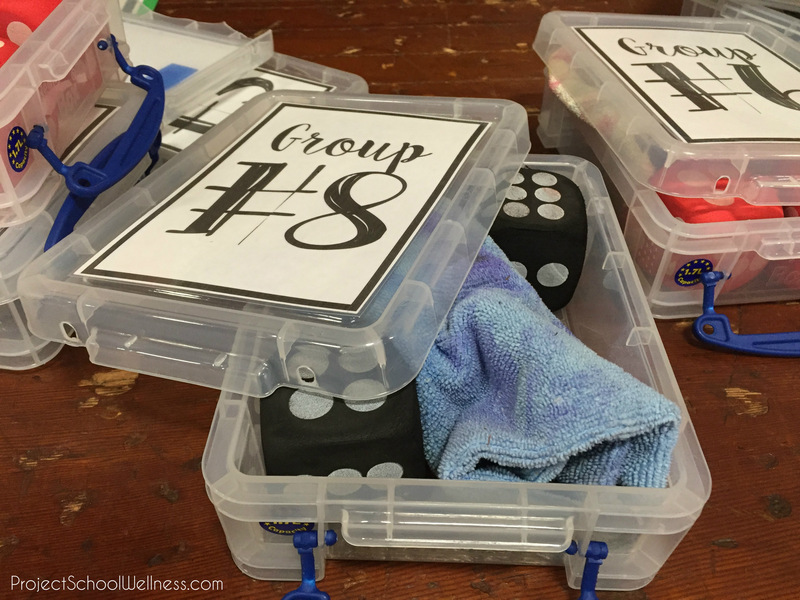 Each box has a deck of cards, foam dice, vis-a-vis markers, dry erase markets and a cleaning rag. 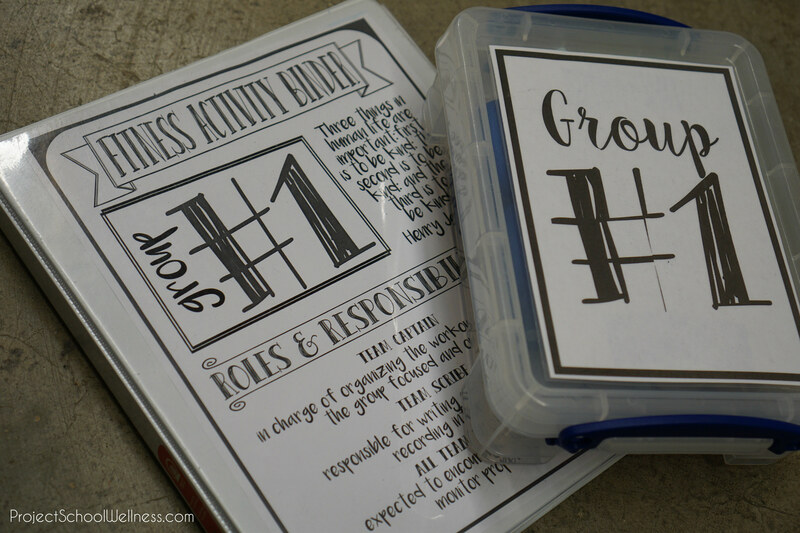 Students use these tools to write exercises on the activity sheets (in plastic protectors) or on their white boards and partake in the activities. Well, that’s it for my fitness warm ups. I hope you’re able to use the freebies I’ve linked to in your classroom! And please share any suggestions as to how my routine can better serve students! Oh and just in case you scrolled passed something, click here to access this mega bundle freebie! Hi Janelle! Wondering if you reuse each box for each class period? I teach 6 periods a day and am wondering about some logistics, like do they wipe clean their sheet, do you check on how they are doing on their sheet ( obviously you are monitoring). I have been eyeing this for a while but am scared because of not know how exactly to run it. Thanks. Thanks for taking time to message! I use the same boxes and binders with all of my classes. I try to have them wipe them clean at the end of each workout session. But if they don’t, the kids in the next class period just wipe them clean before starting. To check, I just wander around and monitor what they’re doing. In my experience, it only takes a few days of going over the procedure for kids to get it. Then for the rest of their time with me as their teacher, it’s smooth sailing! I hope that answers your question! Please don’t hesitate to message me again!